Can the Gods read the future? Maybe not, But Delta Research can. We are nine young immortals, recently returned from the dead — with a little help from Dimension X. We struggle with the awesome, alien powers of the Eye to foresee the fate of the galaxy. The orders are to safeguard the future of the people of the Confederation of Free Worlds. Our attempts to crack the secrets of the Eye consume us, day and night, revealing chilling insights as ConFree’s enemies swarm, secret armies from secret dimensions, marching for Satan, deadly and merciless and invulnerable to human weaponry. But the Eye's secrets are elusive, and ConFree’s alien allies, the Brights, are strangely reluctant to act. A final choice looms: suicide or surrender. Neither is acceptable, not when the ConFree Legion is all that stands between the women and children of ConFree and the gates of Hell. Look to the past, Doctor Dimension advises. What did they teach us in Basic? Our ancestors survived, against overwhelming odds, and founded a new nation. And now it’s our turn. This volume continues with the further adventures of the young prophets of Delta Research, described in the first two books of the Prophet of ConFree series. Prophet and the Eye is the third volume and is now available. I'm very excited about this book. I love these characters and I believe it’s an effective story. 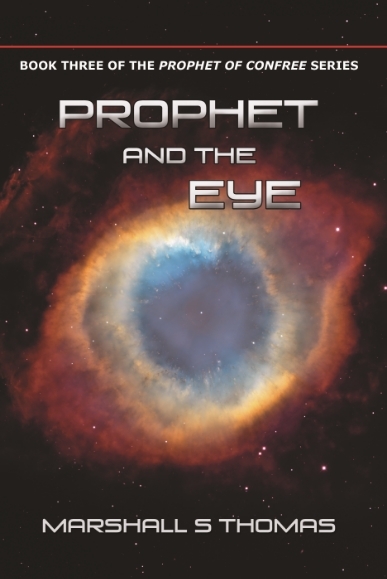 I hope my readers will enjoy Prophet and the Eye. To buy, please check out the Purchase page. Happy reading! Marshall, you mad genius you! Finished Prophet and the Eye. Wow. Incredible. Definitely your best work. Haven't started book 4, but I don't know how you are going to top the Eye. Cover photo — the Helix Nebula: a gaseous envelope expelled by a dying star. From the Hubble Telescope, HubbleSite. Credit: NASA, ESA. C.R. O'Dell (Vanderbilt University), M. Meixner and P. McCullough (STSCI). Public domain.